heatpipe, 32 gal 1 or 1 32 40"X20" 39"X79" 5.5' high-works well on ground. Needs backup. No parasitic energy or pumps to maintain. All systems include mixing valves, high temp ¾” wall insulation on exterior piping, ½ inch wall on interior insulation, charge assemblies, pump isolation valves for easy maintenance, tank thermometer, 2” foam tank insulation, clear labeling, operation manual, and tax rebate forms. Warranty: 30 yr limited on collectors, two years on parts, one year on labor. 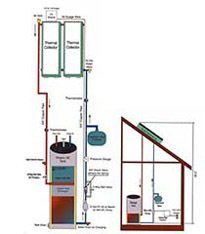 All of these systems, except the thermosyphon, are “closed loop systems” and use storage tanks with internal heat exchangers. These systems come in two configurations: PV PUMPED, ANTIFREEZE SYSTEM, or DRAINBACKSYSTEM (requires a $175 upcharge). Nontoxic antifreeze should be changed every 8 years, or sooner with overheating. Can overheat on vacations & spurt a little antifreeze out relief valve. Antifreeze may reduce collector life a little over pure water. AC pump is faster and collects 10% more heat. Overheat protection can shut system off, extending collector and tank life. No antifreeze changes. For $225, a heat exchanger can be added to drainback tank for future heating of floors, or hot tubs. Collectors must be above tank. 10 gallon drainback tank must mount above HW tank. Requires positive pipe slopes. Uses $2/mo. in electricity. RADIANT SPACE HEATING works great with solar, and keeps on working for decades, as energy costs rise! Architectural considerations: Collectors for space heating are most economical when arranged vertically in banks up to eight collectors. Our shortest collectors are 4’x6.5’ feet high, making a bank arrangement about 5.5 feet high at 60 degree tilt. (Space heating collectors are usually mounted from 60 degrees to vertical. They can even be mounted on south walls). Systems can be either PV pumped antifreeze, or drainback, like our hot water systems. With a small loss in efficiency and small increase in price, we can mount 3x7 or 3x8 collectors horizontally for space heat or hot water, making them only about 3 feet high. Space heating systems can heat pools or hot tubs outside of the heating season. Sizing: A rough rule of thumb for collector sizing is about 10% of the heated floor area in collector area, less if there is passive solar. Thus 2000 sq. ft. requires maybe 200 sq ft of collector, or six or seven 4’x8” collectors. Pricing: We give specific quotes for each space heat system, as circumstances vary. A very rough guide is maybe $3000 for a backup boiler interface, heat exchanger, controls and DHW tank upsize. If 4'X8" collectors are roughly $1400 installed, this 2000 sq ft space heating system may cost around $3000+$8400 (six collectors), or an $11,400 add on to the DHW system. Actual prices vary. You can make your money back on energy savings, and then resell your solar system as equity again when you sell your house!